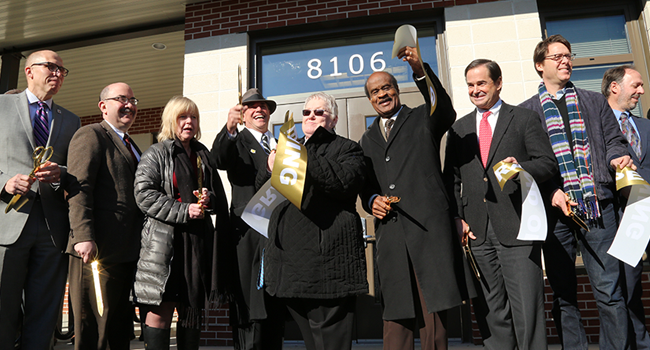 Montgomery County officials helped open the new Progress Place facility on Georgia Avenue in Silver Spring this month. The facility serves the homeless. Progress Place is a facility that serves individuals experiencing homelessness with an array of services: meals, showers, laundry, primary care health services, and one-on-one case management. Progress Place has 21 personal living quarters, providing permanent supportive housing for vulnerable and chronically homeless men and women. The project is a public-private partnership between Montgomery County and Bethesda-based Washington Properties. In exchange for developing the current County-owned property, Washington Properties designed and constructed the new facility at no cost to the County.